Ross County midfielder Jamie Lindsay. Ross County defeated Dundee United 1-0 at Victoria Park thanks to Jamie Lindsay’s late header in their Betfred Cup tie. Lindsay’s 85th minute breakthrough came just four minutes after Staggies goalkeeper Scott Fox had made a superb double save to thwart Nicky Clark’s penalty. The deserved win moves County five points clear of United at the top of Group A, giving them a strong foothold in their bid to qualify for the second round of the competition. County made three changes from the side that defeated Elgin City 2-0 in their opening match last weekend, with Keith Watson, Billy Mckay and Josh Mullin drafted in to replace Callum Morris, Ryan Dow and Tony Dingwall. Chances were few and far between in the early stages, with County offering the first shot on target on 24 minutes when Jamie Lindsay’s long-range effort was beaten away by goalkeeper Matej Rakovan. Staggies defender Keith Watson came closest to opening the scoring when his header from Mullin’s corner was hacked off the line by Paul McMullan, while at the other end Watson made a similar clearance from Adam Barton’s effort. Staggies goalkeeper Scott Fox was called into action for the first time midway through the second-half when he denied Declan Glass’ long-range effort. 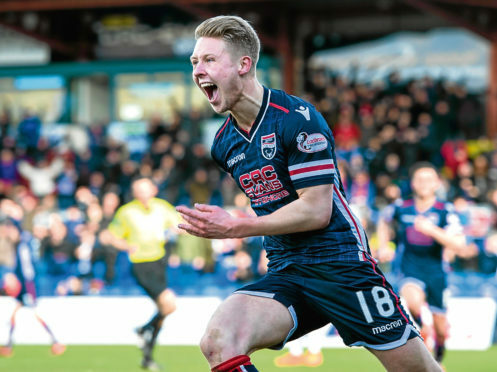 The Staggies came closer to a breakthrough as the second half wore on, with Ross Draper’s headed knock down picking out McManus for a low shot which was gathered by Rakovan at his near post on 68 minutes, before Gardyne curled a 20-yard effort just wide. County continued to threaten, with Gardyne blasting a shot over and Rakovan out sharply to thwart McManus’ effort following a driving run in from the left. United were awarded a spot-kick on 81 minutes when Gardyne was adjudged to have tripped Sam Stanton by referee Willie Collum. Attacker Clark saw his initial effort saved by Fox, who then did brilliantly to turn the former Rangers player’s effort over the bar. The decisive moment arrived just four minutes later when the Staggies broke to great effect, with substitute Dow sending in a sublime cross from the right flank which was met by Lindsay’s guided header from six yards.